The 4 day Classic Inca Trail to Machu Picchu is probably one of the most enigmatic treks in the South America and even the world. Hiking and camping for 4 days on original Inca paths, crossing one ruin after the other and enjoying the amazing views that these Andean Highlands provide you with; hikes have been called emblematic for less. It is also the only way to arrive to the site of Machu Picchu by one of the old and original entrances of the site; the Sun Gate. Here is where you will catch your first complete glimpse of the site which if the weather allows can also be accompanied with an amazing sunrise over the site. You will be taken from Cusco in bus to either Poroy or Ollantaytambo Station for a short train ride to KM 88 from where the trek begins, or you can be taken to KM 82 (where the road stops) and from here start hiking. There is not much difference in the distance as the two paths meet around KM 85. From here you will start with a steep but short climb out of the Urubamba Valley. 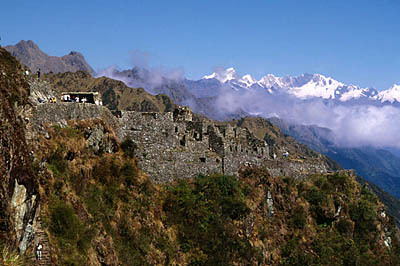 After passing through a small village, the ruins of the Inca hillfort of Huillca Raccay come into view high above the mouth of the river Cusichaca. You will descent to the river and continue for another 7Km before reaching the campsite of Wayllabamba for the first night of camping. Today will be the day when most altitude has to be tackled. You will start the day climbing through steepening woods and this increasingly spectacular terrain brings you to the tree line and a meadow known as Llulluchapampa (3,680m). It is another 1½ hours climb to the first and highest pass of the trail called Dead Woman's Pass at 4,200m. Be aware of the elements here as the sun can burn really profoundly at these altitudes and due to the lack of shelter, the winds can blow very strong. From here you will start descending to the second camp site; Pacamayo at about 3600 meters. Today you will start the day with an hour uphill walking to see the ruins of Runkuracay overlooking the Pacamayo Valley below. From here you will set of for the second highest pass on the trail; the Runkuracay Pass at 4000 meters. 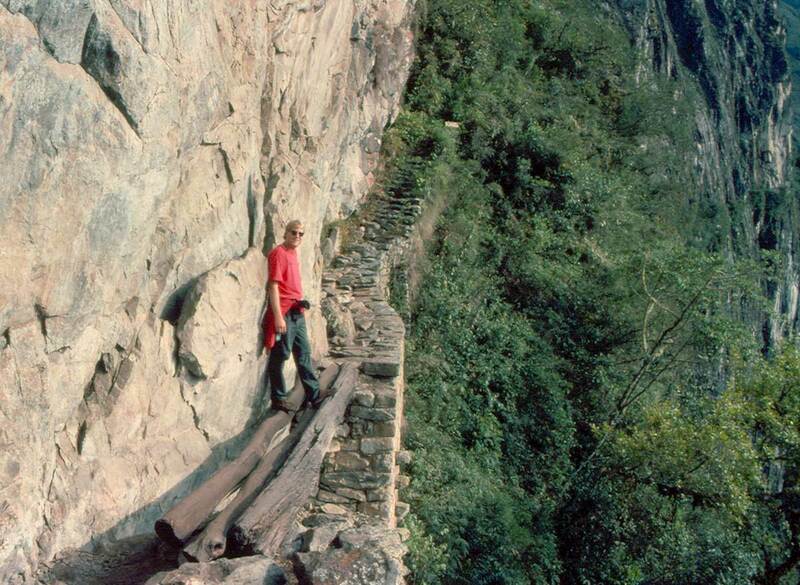 On this section you will also see more and more originally paved Inca paths. You will have to climb another short pass until you reach the ruins of Sayacmarca, known for its stone staircase. This site is still quite unexplained and the setting makes for some amazing pictures and views. From here well pass by another small Inca ruin which is thought to be a “Tambo” or resting house for travelers. You will continue from here and the path will take you slowly going down into the cloud forest full of orchids, hanging mosses, tree ferns and flowers even passing through an impressive Inca tunnel, carved into the rock. From here you’ll continue to the third pass of the trek at 3700 meters. From here you can really appreciate the snow capped peaks of the Salkantay and Mount Veronica in the distance. A few minutes after the pass is Phuyupatamarca, the most impressive Inca ruin so far. The name means 'Town in the Clouds'. Leaving the site via an impressive Inca staircase you descend about a thousand steps carved out in the rocks. From here it is about another three hours before you reach your camping site for the night. There is a small but basic hostal which provides hot showers (US$2) and a store to buy some drinks for your last night camping. As this is the last official camping site, this site may become crowded in the high season. This is also the place where the two day Inca Trail catches up with the 4 day one. 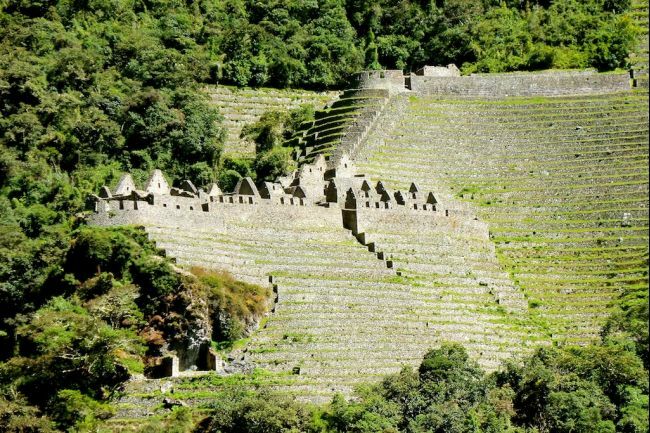 From the camping site it is a small walk to the ruins of Winay Wayna. The name in Quechua means 'forever young' and is named after a variety of pink orchid which grows here. The ruins comprise magnificent agricultural terraces set in an impressive location. Some of the buildings are of impressive quality and there are several beautiful ritual baths, probably used for the last cleansing for pilgrims visiting Machu Picchu. You will return to the camp site for the night. Today the trick is to get up early, around 4.30am to arrive at Machu Picchu before sunrise around 6.30am. It is another 1.5 hours walk to Machu Picchu. You will head down again into the cloud forest over small Inca paths with sometimes having deep drops on one side, definitely a part of the route that is better done slowly. 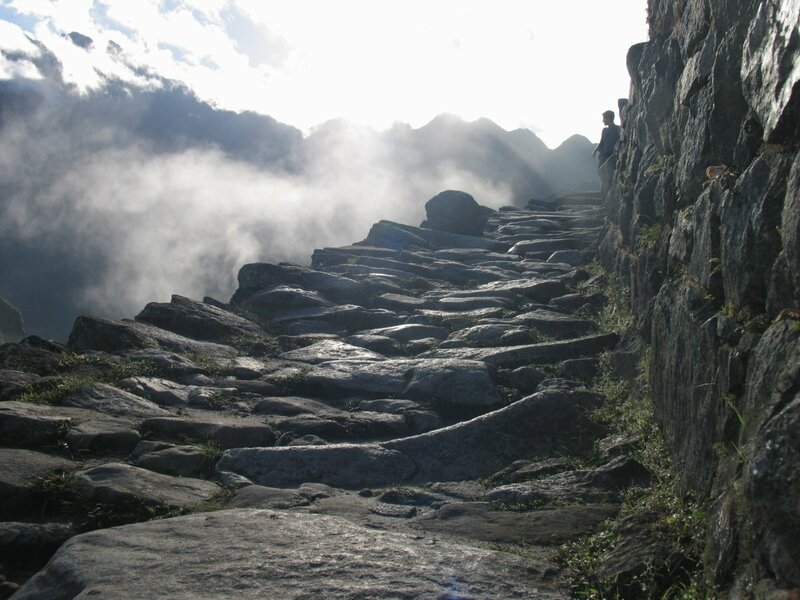 From here you will reach the Sun Gate for a magnificent view of Machu Picchu at sunrise. If you would like to read more about what to see and do at Machu Picchu, please click here.